Standalone device, no PC required to operate the duplicator. Transfer speed of up to 3.9GB/min onto each port simultanesouly regardless of target number. 3 copy modes: Quick Copy, All Partitions Copy and Whole Media Copy. 3 sanitization modes: Quick Erase, Full Erase and DoD Erase. All data formats supported via bit-by-bit duplication (All Partitions Copy and Whole Media Copy). Quick Copy mode supports NTFS, FAT16/32/64 and Linux (ext2/ext3/ext4) file formats. Ureach DOM duplicators are capable of copying at 3.9 GB/m on all ports simultaneously without any speed degradation as number of targets increases. Quick Copy mode only copies contained data in any NTFS, FAT 16/32/64 and Linux (ext2/ext3/ext4) and skips all empty sectors which greatly reduces duplication durations. The bit-for-bit duplication modes All Partitions Copy and Whole Media Copy support all known and unknown data formats. Following interfaces are supported via optionally available adaptors: 7Pin SATA DOM, IDE DOM, Micro SATA, mSATA, M.2(NGFF), and CFast Card. Complies with U.S. Department of Defense data wiping standards. When replacing or discarding HDDs containing sensitive information it is vitally important to make sure the data is securely erased and cannot be retrieved by any third parties. 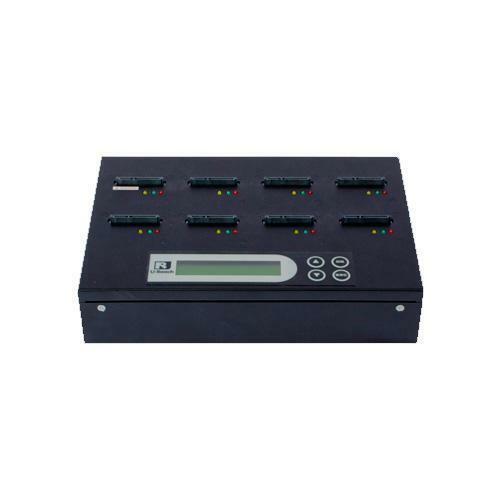 After completing any duplication task, the duplicator automatically powers down each port so users can immediately remove all connected drives without any concerns. Copy Speed not affected by number of targets. High speed compare function guarantees accuracy of duplicated data. Instant power on and off. Easy to boot up without a wait time. Experienced and friendly customer support.